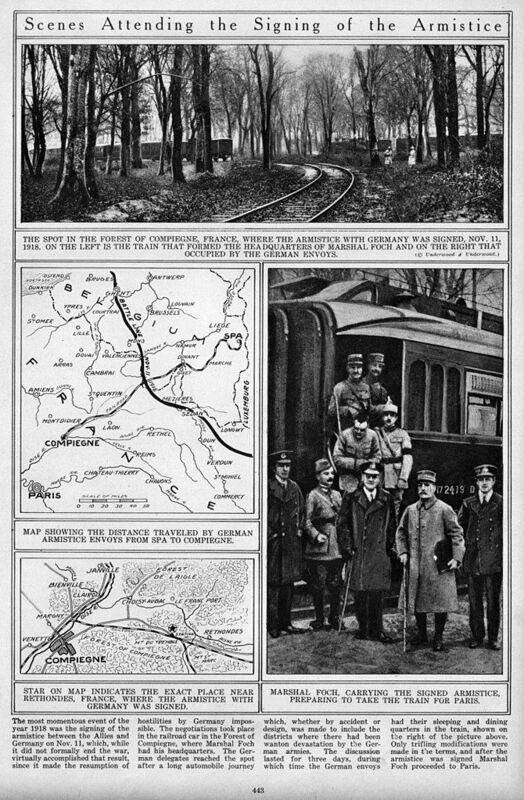 Citation: C N Trueman "Terms of the Armistice"
When the German peace delegation arrived at a railway siding in Compiegne Forest (see photo) to negotiate the terms for an armistice on November 8th, they found that the Allies were in no mood to negotiate at all. Allied Supreme Commander, Ferdinand Foch, believed that there was no need to discuss terms whatsoever as he simply wanted to tell the Germans, led by Matthias Erzberger, what they were going to sign with the expectation that they would have to sign. In this Foch was ironically helped by the German government. The situation in Germany was such that the government feared major social unrest caused by a chronic food shortage. They issued an order to Erzberger that he should sign whatever the Allies placed in front of him. Therefore at 05.10 on November 11th 1918, he signed the 34 terms of the Armistice – as harsh as he may have believed them to be. All occupied lands in Belgium, Luxembourg, and France–plus Alsace-Lorraine, held since 1870 by Germany–were to be evacuated within fourteen days. The Allies were to occupy land in Germany to the west of the River Rhine and bridgeheads on the river’s east bank up to a depth of thirty kilometres. German forces had to be withdrawn from Austria-Hungary, Romania, and Turkey. Germany was to surrender to neutral or Allied ports 10 battleships, 6 battle cruisers, 8 cruisers, and 160 submarines. Germany was also to be stripped of heavy armaments, including 5,000 artillery pieces, 25,000 machine guns, and 2,000 airplanes. The naval blockade would continue. 5,000 locomotives, 150,000 railway cars, and 5,000 trucks would be confiscated from Germany. Germany would be blamed for the war and reparations would be paid for all damage caused. Many of these terms were to form the basis of the Treaty of Versailles.